Trained in cabinetmaking, architect Bernard Maybeck backed the staircase at Grayoaks (1906) in Ross, California, with a sublime dining-room built-in. Bret Morgan Shingle Styles, Harry N. Abrams, Inc.
Few design philosophies have cast houses in a new mold like the Arts & Crafts movement, and few features bring together so many of its forward-thinking ideas as the legendary built-in. 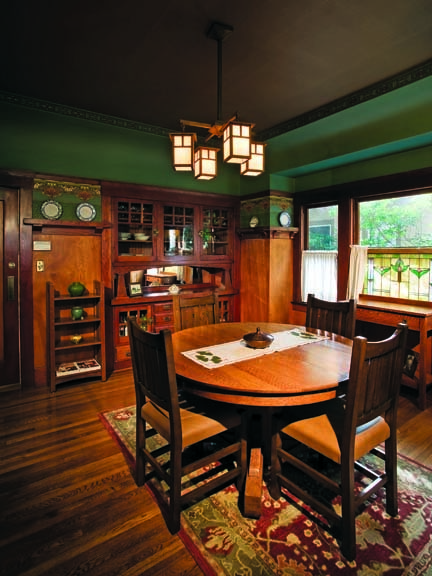 Though examples of these innovative pieces of "permanent furniture" are still doing service in bungalows, Foursquares, and even Tudor and Dutch Colonial Revival houses from 1900 to 1930, many have been reduced to little more than quirky cabinets or empty alcoves during decades of changing tastes. For anyone owning or interested in re-creating these frequently ingenious elements, here&apos;s what was behind the built-in craze and where it went. Like so many things Arts & Crafts, built-ins were part of a wave of reform—an aesthetic about-face from the prevailing tastes of the Victorian era and a charge in new directions. 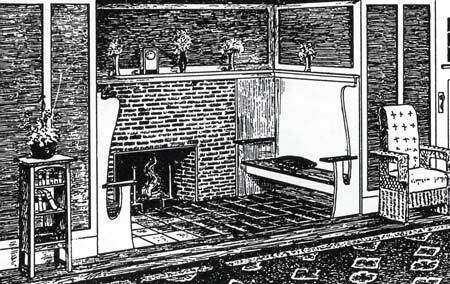 Rejecting the mass-produced, overwrought furniture of the late 19th century (and the eclectic houses and interiors that went with it), designers sought to unify the house&apos;s design elements while simplifying the occupants&apos; lifestyles—a functional necessity in the smaller, servantless suburban houses of the early automobile era. Their solution was not only to coordinate pieces of furniture with the overall architecture of the house but also to fuse them into the structure with seamless schemes and cunning joinery. A wall of beautiful doors can hide a complete boudoir suite of dressing table, drawers, and hanger closets. This opened floor space for other activities while it minimized dust-collecting surfaces. Besides creating a distinctly novel look and space-saving efficiency, the aim of many built-ins was also to be more hygienic. In a day when germ theory and its connection to public health was just sinking in, eliminating dirt and the places it could hide became a crusade. Built-ins helped heed the call by reducing dirt-catching areas—especially the underspaces around legs—that could harbor dust, insects, and most insidiously, microbes. Ironically, the inglenook—one of the classic built-ins of the Arts & Crafts era—had been a favorite of adventurous Victorian architects working in the Shingle and Colonial Revival styles. H.H. Richardson is sometimes credited with importing this idea (two fixed bench seats bookending a hearth for reflective warmth) from England, and he made frequent use of it in his medieval, yet modern, interiors. The fact that the inglenook was almost ancient doesn&apos;t seem to have been an issue for American Arts & Crafts designers and tastemakers; they pop up everywhere from Gustav Stickley&apos;s house plans to the ultimate bungalows of the Greene brothers. Though central heating made the hearth obsolete for warmth after 1900, it carried renewed symbolic and aesthetic significance as the center of the house, and an inglenook only highlighted its importance. 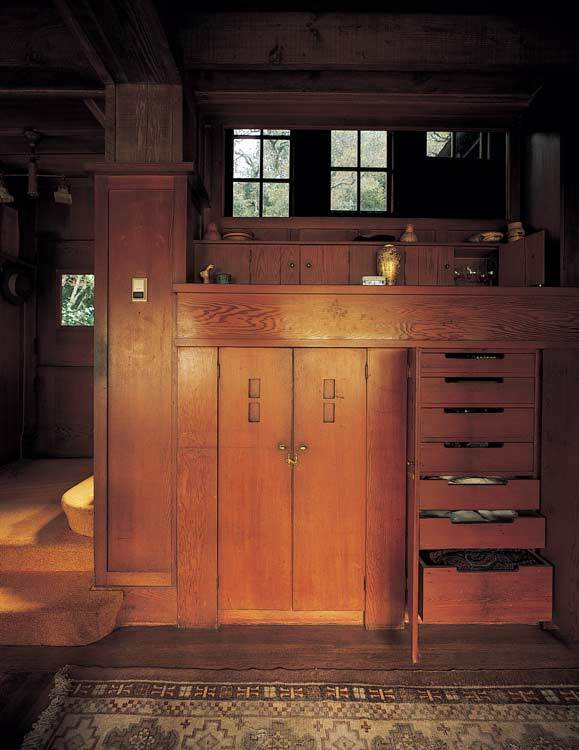 Stickley&apos;s magazine, The Craftsman, extolled the inglenook as the essence of domestic coziness. Also called chimney corners, they came to America from 15th-century England and English architect Richard Norman Shaw. 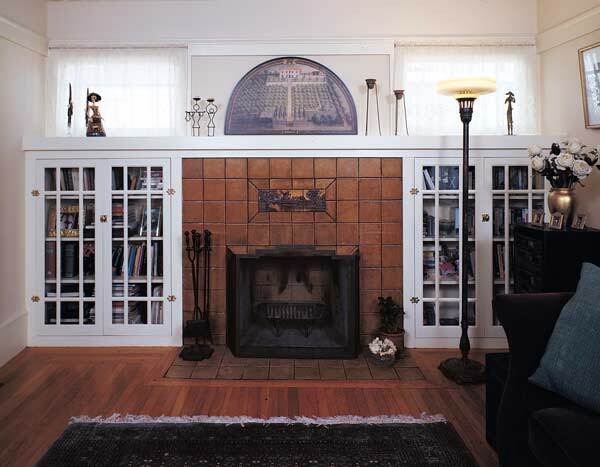 Where an inglenook could not be had, there was sure to be a pair of built-in bookcases flanking the fireplace. An almost ubiquitous feature in planbook and ready-cut bungalows of all breeds, such bookcases presented the opportunity not only to shelve and display books or pottery but also to protect them behind a veil of decorative art-glass doors. Storage made aesthetic was taken to heart in the dining room. 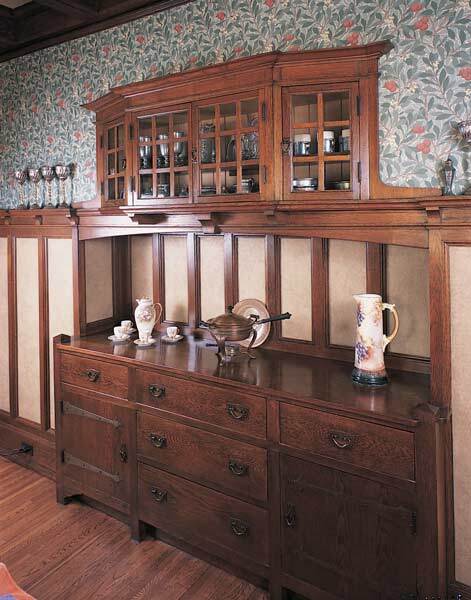 Pantries were not an option in the majority of smaller, Arts & Crafts houses, so a built-in sideboard or "buffet" was all-important for berthing flatware and linens. In the best layouts, it could be built into an alcove so the drawer fronts were flush with the wall, and the mirrored counter was a recess. At the least it was solidly anchored to the wall as a footless mass and commonly ordered as a prefab unit from a millwork manufacturer. Built-ins are firmly secured to the building, but that does not mean that they must meld with a wall. The prime example is the colonnade that provided definition between living areas without actually separating them into rooms. Colonnades are pairs of waist-high cabinetwork that support tapered piers or vaguely classical columns that typically run to a box beam across the ceiling. Though the beam and piers are nonstructural, the casework often overcompensates in practicality by incorporating bookshelves, drawers, a fold-out desk, or combinations thereof. Bench seats under windows or attached to walls are deja vu, too. Starting with Richardson and his acolytes, the bench&apos;s popularity continued unabated with the next generation of designers such as Harvey Ellis, who appended them to colonnades in a now famous illustration in The Craftsman magazine. Bench seats also tucked between a newel post and wall at the bottom of a staircase, where the seat surface could be hinged like a chest for storing footgear. Kitchens caught the brunt of the space crunch in the smaller houses of the early 20th century, and, along with other helpful marvels like gas stoves and electric appliances, built-ins were supposed to make up the difference. Purely utilitarian built-ins such as fold-away ironing boards got double duty out of precious space, but the hyper-compact centerpiece was the dining booth or breakfast nook. Whether the nook was a culinary version of the fireplace inglenook or was transported from the railroad world (some were called "Pullman Dining Rooms"), it was space saving to a fault. Facing benches surrounded a peg-legged table that often folded up for stowing. 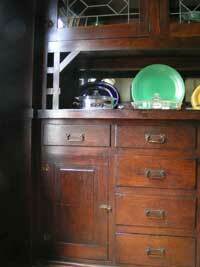 Seats typically opened into chests, and backs could even be built into linen or china closets. Built-in bookcases added an erudite air as well as precious storage to the minimal living rooms of many bungalows. A house without a fireplace might substitute a built-in writing desk in the same space. Even bathrooms and bedrooms benefited from the built-in concept. In-wall medicine cabinets and tubs first appeared during the built-in heyday, but there were fold-up seats and built-in linen cases too. Disappearing beds, such as the famous Murphy In-A-Door bed, freed floor space during daylight hours while built-in dressing tables—actually a vanity and drawers flush in the wall—barely entered the room. As with the Arts & Crafts movement itself, World War I spelled a shift away from built-ins in their largest and most original forms. 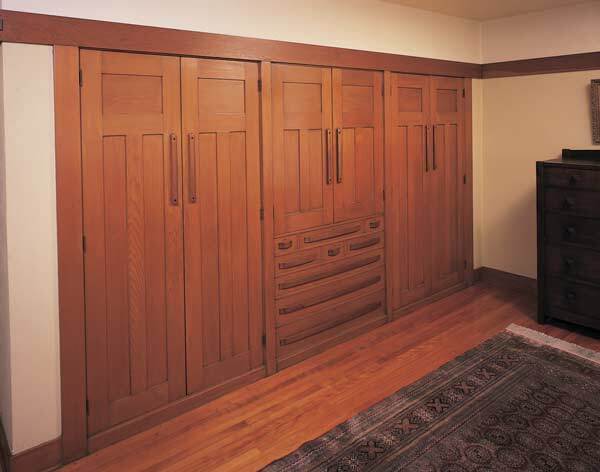 As tastes swung back to the familiar Colonial Revival during the 1920s, the once daring, squared-off lines of Arts & Crafts built-ins looked clunky. Even worse, being fixed-in-place they couldn&apos;t be retired to another room or house, so breakfast nooks and colonnades were simply pried out. 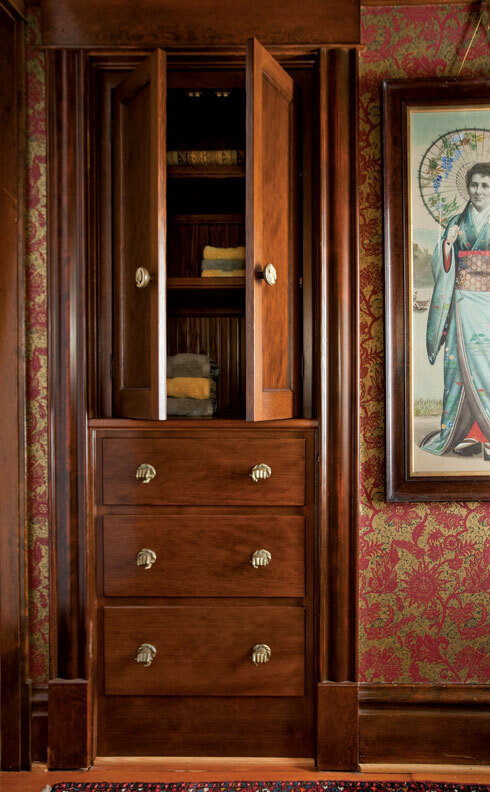 Though actual Arts & Crafts built-ins faded from millwork catalogs by the 1940s, their concepts and convenience live on in the Eurostyle closets, diner booths, and high-tech entertainment centers that continue to serve us everywhere.